Two award-winning Canadian artists performing hits from the world’s most prolific country music artists of all time, that is Country Superstars Live In Concert, Canada’s premier concert experience. Country Superstars Live In Concert, is the ultimate country music show on one stage. 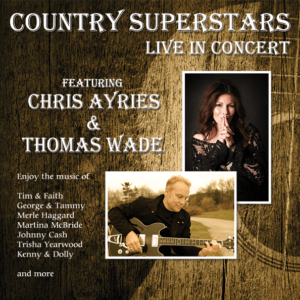 Join Thomas Wade and Chris Ayries on a journey through country music, as they sing together for this one-of-a-kind concert, leaving you shouting for more. Country Superstars Live In Concert takes audiences on a high-energy ride of the hits they know and love with spectacular tributes to all-time country legends and today’s hottest superstars. Country music fans won’t believe their ears as they hear the music of superstars including Merle Haggard, Jonny Cash, Martina McBride, Trisha Yearwood, Marty Robbins, Pattty Lovelace, Ray price and Faith Hill. You’ll also experience a one-of-a-kind presentation of country’s famous duets including Dolly and Kenny, Tim and Faith, and so many more. Country music fans, hang on to your hats for Country Superstars Live In Concert! Growing up in Ontario, singing came just as easily, and necessary, as breathing. The sheer power of her voice alone has enough “wow factor” to win over the most jaded critic , but that’s only half of the story. When it’s time for nuance and quiet intensity, Ayries is right there as well. Her influences range from Annie Lennox to Stevie Nicks to Etta James and Tina Turner. Gladys Knight to Eva Cassidy. There are bits of all of them in there yet her sound is completely her own. From singing for the troops in Bosnia to festivals , concerts and studio sessions , every mile on the road has added another seasoning to the musical stew and added to her momentum. Her writing style appeals to many listeners. It’s rock, it’s rootsy old school R&B and it’s most assuredly pure soul. Thomas Wade grew up in the small town of Burford, Ontario as the oldest son in a musical family. He picked up his first guitar when he was four. The records he grew up loving became his teachers, from Johnny Cash to Elvis to The Beatles. By the age of seven he was writing his own songs. He spent most of his childhood on stage. For ten years he performed with his family band The Silver Wings. In 1982 he was accepted into the Music Industry Arts program at Fanshawe College. He found himself surrounded by people who shared passion for music that he had. After he graduated he permanently left his family band and joined up with a group of talented guys, calling themselves Wayward. Right out of college he was touring with Juno Award winner Marie Bottrell. After departing from Wayward, Thomas signed his first management deal as a solo artist. He took his first trip to Nashville in 1985. Wayward was eventually reborn in the 90s, with Thomas taking on the role of the frontman. From 1996 to 1999, Thomas Wade and Wayward ruled country radio. No other independent act was garnering the same level of success as them. They earned three Juno Nominations and 7 CCMA awards. They won both independent single of the year as well as song of the year in 1997 and 1998. The awards and the Top 40 hits kept on coming until he parted ways with the band – this time permanently. In the wake of Wayward’s end, and in 2000 he released a solo album, Lucky 13. He crafted ambitious songs with lyrics that ranged from charmingly witty to beautifully poignant. With one album he showed the world what he was fully capable of, and Country Music Television backed him every step of the way. In 2001 he began to lose his voice, but he couldn’t figure out why. In November of 2002 he was forced to cancel a series of shows. In 2004, Céline Dion recorded a song he wrote called “Come To Me”. Though this was a confirmation of what he was capable of, the situation with his voice would only get worse. Eventually it got to the point where he could hardly even speak. In 2006 the ailment that had been plaguing him for years finally had a name. He was diagnosed with Oromandibular Dystonia, a neurological disorder that affected his speech and was thought to be incurable. When he learned about the ground-breaking concept of neuroplasticity, he developed his own exercises using the concept to get his speech and voice back. By 2011 he found himself able to start singing again, building himself up slowly by playing in whatever gigs he could. He kept on persisting until, over ten years after his retirement, he had finally reclaimed his voice.